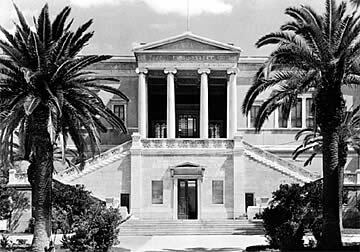 The National Technical University of Athens, outstanding creation by the humanist architect Lysandros Kaftantzoglou (1811-1885), is one of the archetypes of the Athens architectural traditions. It was built with donations by Michail and Eleni Tossizza, Nikolaos Stournaris and Georgios Averoff and was called Metsovio owing to the fact that its founders came from the town of Metsovo. It was the city’s second large-scale building on a spacious lot after the so-called Athens Trilogy. The final solution worked out by Kaftantzoglou for the NTUA complex included a main building and two T-shaped buildings on Patission Street at the intersections with Tossizza and Stournari Streets; at the same time provision was made for another two buildings on Bouboulinas St, which were not finally built. On plan, the main building is organised symmetrically around a square atrium. It is two storeys high and the ground floor functions aesthetically as a foundation. Two monumental staircases lead to the Ionic tetrastyle porch on the upper floor. This porch was copied from the north porch of the Erechtheum and is repeated in the atrium. The colonnade in the ground floor atrium is in the Doric order. 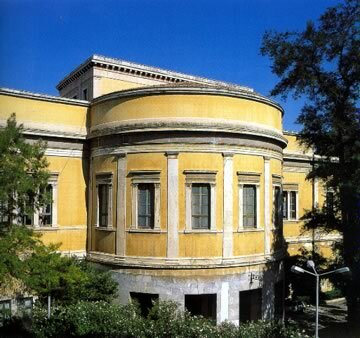 The back of the building has a semi-cylindrical apse. The buildings flanking the entrance are on one floor only with open Doric colonnades that have a dark reddish background. 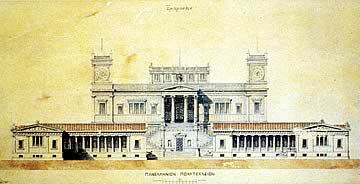 The monumental synthesis is symmetrical with a hierarchical arrangement of volumes: low one-storey masses in the foreground and the high two-storey main volume in the middle. Another characteristic feature is the diversity that arises from the alternation of semi-outdoor, transitional and closed spaces.